If information wants to be free, why are textbooks so expensive? The Process of making law is complex. At the heart of the process are congressional committees, but in all the process involves bargaining between the two parties in Congress, between members of the same party, between the two houses of Congress, and between congressional leadership and the presidency. While there are standard procedures, Congressional majorities often set them aside for the sake of expedience in passing legislation. The lawmaking process in the United States is complex, but easy to understand. It’s complex because there are so many pieces to the puzzle, but easy to understand because every piece is simple. An important difference between the U.S. and many other countries is that in the U.S. the rank-and-file members of the legislature are actively involved in the writing of the law. In many parliamentary systems, the party leadership (the Prime Minster and her Cabinet) propose the laws, a specialized staff writes the text, in consultation with the Cabinet, and when the Cabinet is satisfied, it submits it to the parliament, where—usually—the party’s rank-and-file Members of Parliament duly vote for it. In the U.S., the lawmaking process goes through the congressional committees, where the party leadership has no direct control, and may have limited influence. Members of that committee, no matter how lowly they are ranked, get a direct say in the wording of the bill. And because each of these legislators represents a particular constituency, one of the most important factors that shapes each one’s perspective on a bill is how the folks back home will view it. The U.S. is unusual in that policies that are national in scope, and sometimes have global effects, are so extensively shaped by local interests. Whether that is a good thing or a bad one, it is something that occurs entirely because of district-based representation: the only people any Representative or Senator truly has to worry about pleasing are his or her own constituents. All laws have to be completed, from introduction to becoming law, within one term of Congress. This is the 2-year time frame between Congressional elections. After elections in November of even-numbered years, the next term of Congress will begin in early January of the following odd-numbered year, and usually end in late December following the next elections two years later. Any bill that does not get completed in that time frame dies, and must be resubmitted in the next session. If party control of Congress does not change, the resubmission may be pro-forma, and work may pick up where it left off in the preceding Congress. But elections can cause control of the House, the Senate, or both to shift from one party to the other, and every 4 years can cause a change in which party controls the presidency. So the pressure to complete bills in that two year period can be intense. 2. The bill goes to a committee, which discusses and votes on the bill. 3. The bill goes before the whole chamber, which debates it and votes on it. 4. The bill is approved by the other chamber. 5. The bill gets sent to the president to get signed into law or vetoed. So let’s dig deeper into the lawmaking process, looking at each of these 5 steps in more depth. Bills have several sources, reflecting the varied nature of political interests. 1. First, the bill may actually come from the Congressmember herself—she and her staff may have written the text of the bill, as a response to an issue that she finds important, or that matters greatly to her constituents. The community may find that its water supply is being polluted by an upstream user, and their Representative or Senator—or both—may introduce a bill to tighten pollution standards. This is an important difference between the U.S. and most other countries—in most legislatures individual members do not submit bills, but only respond to bills crafted by the leaders of the party (or parties) that have a majority and control the Parliamentary leadership. 2. The bill may come from the President. Presidents (their staff, really, but at the President’s direction) may write bills and send them to their party’s leadership in Congress, who will submit them on behalf of the President. Given that the President is the only elected official who represents the whole country, these will tend to be issues of national importance, rather than local ones (which are more likely to draw the attention of a Representative). But any national problem also affects particular states and localities, so Representatives and Senators may also be submitting bills dealing with the issue the President wants to address. 3. Interest groups also can draft bills, and give them to a supportive member of Congress to submit. For the Congressmember, this can lessen the demands on his staff’s time, keep the interest group supportive of him, and allow him to announce to constituents back home that he is supportive of whatever issue the bill promotes. Sometimes a bill is submitted that is the only one addressing a particular issue or promoting a particular cause, but more often an issue draws multiple competing bills. Almost any issue important enough to get noticed will be noticed by more than one member of Congress, and all those who notice it and think it is important to their constituents will want to submit legislation so they can take credit for doing so. Frequently, therefore, there will be multiple bills about the same issue, competing with each other for space on committee’s agendas. Another way Congressmembers can take credit for supporting an issue is to sign on as a co-sponsor of a bill submitted by another member (who is the official sponsor). When the Representative or Senator tells his constituents, “I have sponsored legislation to…” that does not mean he actually drafted and submitted the bill, but may mean only that he has added his name in support to a bill drafted and submitted by another member of his chamber. Submitting bills can also be a good way to get credit without doing any real work. Constituents do not often closely follow the process of bills through Congress (although through the Library of Congress’s Thomas.loc.gov website, you can do so), so their Representative or Senator can gain favor from them simply by announcing that they have introduced legislation addressing a particular problem. They don’t need to have any intent of ever putting real legislative effort into the bill—if a citizen happens to ask the fate of the bill, the Congressmember can just blame Congress, or the other party, for not passing it. Keep in mind that the great majority of bills introduced into Congress never pass. There are several reasons for this. First, many are duplicates, as multiple members submit bills addressing the same issue. Second, the political changes a bill proposes just may not have support from a majority. Third, even though bills get distributed among different committees, more bills can be submitted than the committees can address. So this makes it easy to submit a bill and take credit, despite having no intention of following up with a dedicated legislative effort. And it indicates the challenge that can lie before a legislator who does intend to devote serious effort to passing a bill they’ve submitted. The overwhelming majority of legislative activity takes place in committees, so this is where most of the political intrigue and conflict happens as well. This intrigue begins with the choice of committee assignments for a bill. Technically, the leader of the chamber—the Speaker of the House and the Senate Majority Leader—have authority to determine to which committee a bill is assigned. In practice, with thousands of bills being submitted each year, the chamber leader doesn’t often get directly involved but has a person on his or her office staff who does the delegating, which is often done in a non-political manner. But the chamber leader can get involved in that decision, if he or she wants to exert influence over the legislation. Many bills get assigned to multiple committees, in which case there is one primary committee, and all the other committees are secondary committees, with some say on the bill, but not with the power over it that the primary committee has. For example, the “Jobs for America Act,” introduced to the House in 2014, was assigned to 9 different committees, as recorded on the Library of Congress’s thomas.loc.gov website. important committees, as it has jurisdiction over all bills that raise revenue for the federal government), and the others are secondary committees. The Rules Committee, though, as we will see later, is also a very important one. Once in committee, authority over actions taken with regard to a bill fall to the Committee’s Chairperson, who often assigns the bill to a particular subcommittee. 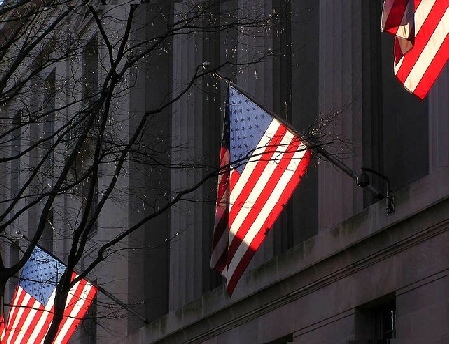 For example, in the House Judiciary Committee, the Jobs for America bill—designed to discourage companies from outsourcing jobs to other countries, and encourage them to bring outsourced jobs back on-shore—was assigned to the Subcommittee on Regulatory Reform, Commercial and Antitrust law. Again, the Committee Chair may have a reasonable choice about which subcommittee to assign a bill to, which gives him some degree of agenda-control as well. Additionally, the Chair may choose to not take any action on the bill at all, neither assigning it to a subcommittee nor scheduling it for any action by the full committee—essentially killing it through intentional neglect—unless she can be pressured into taking action, whether by her party’s leadership or by sponsors of the bill. It cannot be overemphasized that committees are the graveyard of legislation—the great majority of bills die in committee. For example, govtrack.us has this reference to the 1999 Defense of the Environment Act. To use political science terminology, committees are veto points, and committee Chairs are veto players. A veto point is any point in the process at which a veto player can use their influence to kill a bill. Being a veto player is an important aspect of agenda control, which involves not only getting your own preferred issues on the agenda but keeping others’ preferred issues off it (called “negative agenda control”). This concept is applicable outside of Congress, and even outside of government—all organizations have people who are veto players, and they wield significant political power within their organization. If the bill is assigned to a subcommittee, agenda control falls to that subcommittee’s Chair. The subcommittee Chair also may choose to take no action on a bill, but like the Committee Chair may also be subject to pressure by party leaders or the bill’s sponsors. Sometimes there is conflict between party leaders who are trying to hide the bill in a committee or subcommittee to let it die a slow lingering death and bill sponsors who are defying their own party’s leadership and trying to force the committee or subcommittee to give serious attention to the bill. If the subcommittee chair schedules the bill for action, two types of activity may occur: hearings and markup. Hearings involve bringing in people to speak about the bill, both pro and con. These people can be government officials from the executive branch agencies, academic experts, celebrities who’ve taken on an issue as a cause, and even average citizens invited by a Representative on the subcommittee. Because these hearings are organized by the party in the majority, they are usually skewed toward having more speakers supporting the majority’s general position on the bill than the minority’s position, sometimes to the almost total exclusion of any speakers invited by the minority. Markup is the process of arguing over, and revising, the text of the bill. Whatever the bill’s author may have originally written, it will almost always be subject to considerable revision. Suggested revisions may take several forms. They may be friendly amendments, designed to clarify the bill’s meaning or effects, or to make it more satisfactory to more members of Congress so as to increase its chances of passing. They may be unfriendly amendments, designed to weaken the bill’s affects or make it so unsatisfactory that it has no actual chance of passing. And at other times they may be side-issues added in just to buy the supporting votes of other Congressmembers. Whether friendly or hostile, amendments may be very small, such as changing “and” to “or,” or they can be much bigger, substantially revising an entire section of a bill. At the extreme, an amendment can be a complete replacement of the whole current text of a bill. On extraordinary occasions an amendment consisting of an entirely new bill, addressing a completely different issue, can be substituted for the existing text. This is a way of jumpstarting the legislative process for another bill by hijacking the active status of a bill that is already under consideration. Markup is the official approach to shaping legislation, but work takes place outside the conference room as well. The members of the majority may not want to begin official markup on a bill until they have reached agreement on what they want it to say. And just because they are all members of the majority does not mean that they will all agree, so these legislative battles are often fierce and aggressive. For example, in passing the Affordable Care Act (Obamacare), conservative Democrats in the Committee on Energy and Commerce withheld their support for their own party’s bill until they had bargained with the Committee Chair, the Speaker of the House, and the White House Chief of Staff for changes that would reduce the cost of the bill. Only then did the Committee officially begin to do markup. If the subcommittee comes to agreement on a bill, meaning a majority votes in favor of it after markup, it goes back to the parent committee. (Alternatively, the bill may never have gone to a subcommittee, but been kept at the full committee level by the committee Chair.) At this point the committee Chair once again has agenda control, and may choose to bring the bill to the committee’s attention, to schedule it to be heard after work on some other bill is concluded, or may, as noted before, ignore it and try to let it die of neglect. If the bill is put on the committee’s agenda and actively addressed, there may be more hearings, and there will usually be more markup, where once again the bill’s author may be forced to fight valiantly to preserve their preferred version of the bill, or—if the bill was substantially changed in subcommittee—fight to return the bill to a more satisfactory version. They may also have to accept more changes to gain the votes of more committee members. If a bill gets approved by committee, it goes before the full chamber. (I.e., a bill from the House Foreign Relations Committee goes to the floor of the House, and a bill from the Senate Foreign Relations Committee goes to the floor of the Senate). At this point agenda control shifts to the party leaders in that chamber, who have the authority to determine when—or if—a bill will scheduled for debate by the whole chamber. If they do not schedule it, the bill still may die, despite having made it through committee, or—rarely—it may be forced onto the schedule for debate if enough members of the chamber sign a petition. Up to this stage, the legislative process has been pretty much the same in each chamber: committees are committees, whether in the House or Senate. But once a bill is out of committee, there are important differences between the two chambers. In the House each bill has a set of debate rules attached to it by the House Committee on Rules, while in the Senate there is unlimited debate and the potential to filibuster. In the House, and only in the House, each bill has a set of rules attached to it by the House Committee on Rules that determine the procedure for debate on the floor of the House. The Rules Committee’s membership is controlled by the Speaker of the House, and the ability to set the rules of debate give the Rules Committee immense power over the fate of bills. The rules for debate specify how much time will allotted for debating a bill on the floor of the House (even as little as zero, although that is rare. The time available for debate is normally divided equally between the parties, and the time available to each party is doled out in carefully controlled allotments among the party’s members who want to speak—a Representative may get no more than two minutes to speak, unless he can get another member to donate some of his or her time. The Rules Committee will also normally choose either a “closed” or “open” rule for offering amendments on the floor of the House. A closed rule means no amendments can be offered, while an open rule allows amendments to be offered. The Committee may also at times designate a complex rule, which will specify certain amendments that may be offered. Imagine you are the author of the bill, and you are satisfied with its form coming out of committee. Would you prefer 1) rules limiting debate to just an hour and restricting possible amendments to it, or 2) rules allowing many hours of debate and a large number of amendments to be offered? If you said 1, you’ve made a wise legislative choice, and you just have to hope the Rules Committee sees it your way. The House Rules Committee has one other special power that can have momentous impact on legislation, the self-executing rule. A self-executing rule states that once the rules resolution is passed, specific language for a bill shall be considered to have been approved. This is a way of amending a bill through the back door. Although this is a non-traditional way to amend legislation is has become more common in recent years. This tool is now frequently used to avoid direct votes on measures that would be controversial if discussed individually or are too significant to risk being held up by the traditional legislative process…it provides an opportunity incorporate eleventh-hour changes into a bill in order to attract the floor votes necessary for passage. This method of legislating has increased the already substantial power of the Rules Committee, and as the Speaker of the House appoints the members of the Committee, it increases the power of the House leadership to shape legislation and—when convenient for them—bypass some of the difficulties of the legislative process. The Senate has no committee that sets rules for debate. Instead it has a tradition of unlimited debate. When a bill is being debated the debate continues until 3/5 of the Senate (60 of the 100 senators) votes to impose cloture—that is, to end debate and move to a final vote. Additionally, the time available for any member to speak is not limited or controlled by their party leaders—whoever has the floor has the floor as long as they can continue speaking. Since 1900, there have been 9 filibusters by individual senators that lasted over 10 hours each. Three of those lasted for over 20 hours, with the record being held by South Carolina Senator Strom Thurmond’s 24 hour and 18 minute filibuster in a failed attempt to prevent passage of the 1957 Civil Rights Act. In 1964, a group of Southern senators collectively filibustered for 75 hours against another Civil Rights Act, but also failed to prevent its passage. When the Senator who is filibustering yields the floor, a cloture vote can be called, to end debate and move to a final vote. As noted above, it takes 60 votes to impose cloture, which means a minority of 41 out of 100 senators can block a bill from ever being voted on. Unless a supermajority of 60 senators is willing to allow a bill to pass, it cannot come to a vote. That doesn’t mean all bills pass with at least 60 votes. A senator can vote “yes” on imposing cloture—ending debate and allowing the bill to come to a vote—and still vote “no” on the bill itself. But as long as 41 senators are unwilling to accept a loss on the final vote, they can keep debate open and block a final vote; so a bill could have enough votes to pass, but not enough votes to ever get the chance to pass. To put this in political science terms, this is another veto point, and senators who filibuster are attempting to be veto players. They don’t always succeed, but even if they fail to block a bill from passing, they can take credit with their constituents for their effort. Understanding the Senate today requires understanding how the filibuster has changed over the years, as the Senate has revised filibuster rules. For example the rule allowing cloture was not introduced until the 20th century, and when it was enacted the number was set at a 2/3 majority, but then decreased to 3/5 in in 1975, which makes it easier to end debate. But most significantly, in the same year the Senate changed the rules to make filibustering much easier. In the 1970s the Senate changed the rules to allow for a “two track” legislative process. This means the Senate can have multiple bills on the floor at the same time, and if one is being filibustered they will just set it aside and work on one of the other bills. They also no longer require the filibustering senator to hold the floor and speak continuously—all they have to do is notify the Senate Majority Leader that they are filibustering, and unless or until the Majority Leader can round up 41 votes to impose cloture, the filibuster continues with no more actual effort on the part of the filibustering senator (except, perhaps, trying to persuade enough Senators to not vote for cloture. This has resulted in an explosion in the use of the filibuster, simply because it is so much easier to use now. The chart below tracks this increase. 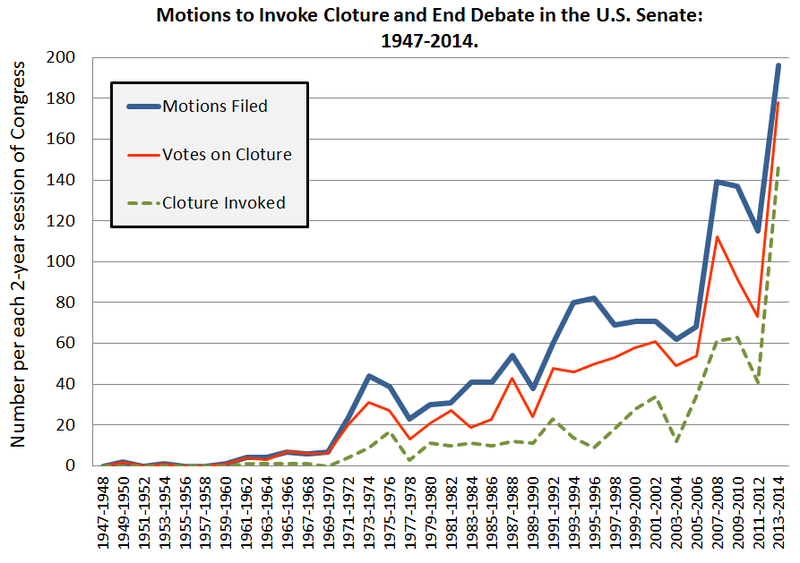 It doesn’t show filibusters themselves, since that information is not recorded (it is sometimes an informal process that leaves no official record), but it does show the number of 1) motions to invoke cloture (motions to have a vote on ending debate), 2) the number of actual cloture votes held, and the number of times cloture is invoked (the number of successful cloture votes). The uptick at the beginning of the 1970s, as the rules changed, is noticeable. More recently there is another sharp increase that began in the early 2000s, which is attributable to a greater partisan divide in Congress, where the parties are less willing to try to compromise with each other. This one chart demonstrates the increasing difficulty of passing legislation through the Senate. Remember that the Framers of the Constitution wanted to limit the power of government, so they divided the powers between the states and the central government (federalism), further separated the powers of the central government into three branches (separation of powers), and then divided the legislative branch into two chambers of equal power (symmetric bicameralism) to ensure that the legislative process would be slow and deliberative. And on top of all that the Senate has used its Article 1, §5 authority to determine its own rules of proceeding to allow a minority to block legislation. To understand the legislative process in the U.S., one has to understand these ways in which it is structured so as to make it much easier to block legislation than to pass it. No bill can be sent to the President to be signed into law until both chambers have passed precisely the same bill. If the President signed one chamber’s version, that would mean some elements of the law would not have passed through both houses of Congress, which would violate the Constitution. But with both houses of Congress working on similar bills, even if they begin with identical versions (as they sometimes do), by the time each chamber does its own markup and amending of the bill, they normally have versions that are not the same. For example, a bill to reform a federal welfare program might have the House writing different eligibility requirements for recipients than the Senate does; or a bill to provide subsidies for nuclear power research might have more money allocated by one house than by the other. These conflicting bills are worked out through a process of negotiation and compromise. Let’s say the Senate has passed a bill. 1. First, the House can then take up the bill and pass it as is, with no changes, generally without going through the committee process, and even if a similar bill is already in (or even already has been passed by) a House committee. 2. Second, instead of just agreeing to the Senate’s bill, the House can pass it but with amendments. The bill then returns to the Senate, which can either accept the House’s amendments and pass the bill, or it can amend the House’s amendments—such an amendment is called a first-order amendment. The bill then returns to the House, which can accept the bill as amended or amend the Senate’s amendments of the House amendments—these amendments are called second-order amendments. The rules of both houses prohibit further amendment of amendments, except when one of them decides to waive their own rules (since each chamber makes its own rules, there is nothing that can prevent them from waiving their own rules whenever they find it convenient to do so). The most important issue to understand here is not the terminology about first and second order amendments, but to understand that getting to an agreement between both chambers is a process, and that process can involve a bill ping-ponging back and forth between the two chambers several times. During this time, there is generally informal negotiation occurring between the two chambers as each tries to figure out what the other will accept. And as with all negotiations, each side wants to give up less than the other side does. So some of the negotiations will involve bluffing. For example, if the House has approved $1 billion in spending on a project, and the Senate has approved $1.5 billion, and a senator suggests compromising at $1.3 billion, the House member may say, “There is no way the House will accept that much spending on this program.” The Senator, then, has to try to determine whether the Representative is sincere or is bluffing. That is to say, congressional negotiations are not fundamentally different from any other types of negotiations, and we should not be surprised to find a good amount of gamesmanship involved. 3. Third, if agreement appears difficult to reach, particularly in the case of complex bills where there can be disagreements about many different elements of the bill, the two chambers will normally appoint a conference committee. This is a temporary committee composed of both Representatives and Senators, normally those most interested in the bill and a representative of each chamber’s leadership, who job is to find a compromise on the disputed parts of the bills. Depending on how complex the issues are and how far apart the two sides are, this could occur quickly or it could drag on for a considerable amount of time. And as with any congressional legislative process, not all of the negotiation will take place in the conference room—legislators will talk one-on-one or in small groups, in their offices, during lunch, or wherever they find it convenient to meet. While there is a standard procedure for passing legislation, in the end we should remember that legislation is a political contest, a battle between opposing sides, and sometimes the normal procedures are apt to get stretched to the limit, if not broken. For example, in enacting the Affordable Care Act (Obamacare), multiple Senate committees spent months drafting bills, both in a long process of negotiation between members of both parties, and with representatives of the President as well as representatives of the health insurance and pharmaceutical industries. Then Senate Majority leader Harry Reid drafted a bill—no doubt taking into account all that had been settled in previous negotiations—and made it an amendment that replaced the entire text of a wholly unrelated bill that had been sent to the Senate by the House; one to offer tax credits to military veterans buying their first homes. Those tax credits had been already added to another bill, passed, and signed into law two weeks earlier, so nobody objected to the hijacking of this other bill. 5. The Bill Gets Sent to the President to Be Signed into Law or Vetoed. Every bill that gets passed by both House and Senate is then sent to the President, who has several options. 1. The President can sign the bill, and it becomes effective law. 2. The President can veto the law—the final veto point in the process—in which case Congress can enact the law over the veto by re-passing it (with no changes) with a 2/3 majority in each chamber. This is called the veto override. 3. The President can ignore the bill, and it will become effective law after 10 days, not counting Sundays. The Framers of the Constitution inserted this provision to ensure that presidents could not just ignore bills and leave them in limbo forever—if they want to stop a bill from becoming law, they must take action by vetoing the law. 4. Because all bills must become law by the end of the session of Congress, if less than 10 days remain in that session, not counting Sundays, a president can ignore the bill and it will not become law—this is called the pocket veto. But all of this makes it sound as though presidents don’t get involved until the end of the process. In truth, presidents are often actively involved in the lawmaking process. Their involvement begins with trying to build public support for policy proposals, particularly in their election campaigns and the annual State of the Union address, as well as “going public” with efforts to persuade citizens to let Congressmembers know they support the President’s policies. Presidents also submit bills and negotiate regularly with key lawmakers, mostly through aides—whether members of the White House Staff or representatives from executive branch agencies—but also sometimes directly. It has been said that there are no strong men in the Oval Office, indicating that when the President invites legislators to meet with him to discuss an issue, he gains an advantage just by having the home court advantage of hosting the meetings in the world’s most recognizable office. All of these actions are designed to shape or block legislation. If a president can persuade Congress to quit working on a bill due to his veto threat, then he doesn’t ever have to formally cast the veto. Presidential support or opposition is one of the most significant factors in determining whether a bill successfully passes Congress. Because of separation of powers, the President is not part of the legislature, but nonetheless presidents have enough influence on legislation that presidential scholar Clinton Rossiter declared that among the roles of the presidency was the role of “Chief Legislator.” At all times during the legislative process, even if the President is not actively involved the specter of his potential to block legislation shapes Congress’s activity. 7. in the end it’s about winning, not about how you play the game, because constituents don’t reward their Senators and Representatives for playing fair, but for delivering—or at least announcing their support for—legislation that’s popular back home. 1. Cannan, John. 2013. “A Legislative History of the Affordable Care Act: How Legislative Procedure Shapes Legislative History.” Law Library Journal 105(2): 131-173. 2. Gailmard, Sean, and Jeffery A. Jenkins. 2007. “Negative Agenda Control in the Senate and House: Fingerprints of Majority Party Power.” The Journal of Politics 69(3): 689-700. 5. See the U.S. Senate’s website, http://www.senate.gov/artandhistory/history/common/briefing/Filibuster_Cloture.htm, and the Online Etymology Dictionary, http://www.etymonline.com/index.php?term=filibuster. 6. Rybicki, Elizabeth. 2013. “Conference Committee and Related Procedures: An Introduction. Congressional Research Service. http://www.senate.gov/CRSReports/crs-publish.cfm?pid=%26*2D4Q%3C[3%0A. 7. Richey, Warrn. 2014. “Did Congress Pass Obamacare the Right Way? Court Dismisses Lawsuit.” Christian Science Monitor. July 29. http://www.csmonitor.com/USA/Justice/2014/0729/Did-Congress-pass-Obamacare-the-right-way-Court-dismisses-lawsuit. 8. Rossiter, Clinton. 1960. The American Presidency. New York and Toronto: The New American Library. p.26. Put yourself in the position of a legislator who has introduced a bill. If you have submitted it just so you can look good to your constituents, you don’t really care where it goes after you submit it. But if it’s legislation you do care about, then you have a stake in your bill’s committee assignment. You may want to try to influence the chamber leader’s choice, so that it goes to a friendly committee. And your best chance to influence it is to have it go to a committee on which you sit. In the example above, the Jobs for America Act was submitted to the House by Representative Dave Camp, and the primary committee to which it was assigned was the Committee on Ways and Means, of which Camp was the Chair. This meant he was in position to control the fate of his own bill and shepherd it through his own committee. If he had not been a member of any of the committees hearing the bill, he would have had very little influence over its fate after submitting it. That was the fate, for example of a bill to protect the Great Lakes from Asian Carp by closing off the Chicago Ship Canal—not one of the sponsors of the bill sat on the committee to which the bill was assigned, and the bill went nowhere. 11. Open rules, rules, closed rules, complex rules, and self-executing rules. 15. The President’s role in lawmaking.